Amazon learned the hard way that it’s too late to break into the phone market. The Amazon Fire line of smartphones was a disaster, soon discontinued. But when it comes to filling the home with consumer products ranging from books to laundry soap to gun safes, nobody does it better than Amazon. Amazon's lineup of Kindle ebook readers have been a market-dominating success, it appears that the company’s Alexa-powered products are intended to secure and expand that hegemony. Let’s see what consumer needs are fufilled by each of these Echo products. The original Amazon Echo ($99.99) smart speaker has shrunk and gotten new clothes. Six colored fabric sleeves are available to dress up the black cylinder. The Echo’s sound has been improved with a 2.5-inch woofer complementing the 0.6-inch tweeter. Even better, multiple Echoes can now be synchronized to play your tunes as you move from room to room. Of course, Alexa can also help you shop on Amazon, tell you the news and weather while you dress, answer homework questions, and much more. The Echo Plus ($149.99) is the size of the first-generation Echo. Its “plus” is a built-in home automation hub that is compatible with the devices of over 100 partners. This is a big deal; home automation fans who mix and match devices from different vendors have been plagued by too many proprietary hubs. With Alexa's help, the Echo Plus can control smart lights, thermostats, locks, garage doors, sprinklers, and more. For a limited time, the Plus comes complete with a Philips Hue smart light bulb to get you started down the smart home path. The Echo Dot - 2nd Generation ($49.99) is a scaled-down Echo for the economy-minded, or for those who want Alexa in many rooms; if you buy three Dots, you save $20. The speaker is rather tinny, but the Dot can perform all the other functions its big sisters can. The Echo Show ($229.99) has a 7-inch screen for video calls, streaming video, viewing photos or recipes, or for monitoring security cameras. Dual 2.0-inch speakers provide big sound. It, too, can play across multiple rooms equipped with Echo devices. The Show provides music from Amazon Music, Spotify, Pandora, and other sources, including lyrics. On the downside, the Echo Show can no longer access YouTube, as Google has cut off its competitor. (YouTube is available on Google Home smart speakers.) Since Youtube is by far the most popular source of online videos, this will hurt Amazon. Of course, you can watch Amazon Video on your Echo Show. The Echo Connect device ($34.99) is a bridge between Echo devices and landline phone wires. It can sync with the contacts on your mobile phone, enabling you to call anyone by speaking their name. The Echo Look ($199.99) https://goo.gl/5uhbTG is a portable device for fashionistas. You can take it into the fitting room (bedroom, or bathroom) with you, and take full-length photos or video of yourself, hands-free. Then you can instantly see how you look to others. The Look includes a Style Check digital assistant that offers a second opinion or suggest new clothing brands. You can also share photos and videos with people who are not in the fitting room with you. Just be careful to choose the right contact! And finally, one that seems a bit weird. Echo Buttons look like hockey pucks with colorful glowing buttons. Amazon says they are meant to enhance voice interactions with compatible Echo devices, and can be used to play games with friends and family. Think trivia games, where users push a button, and then say the answer. 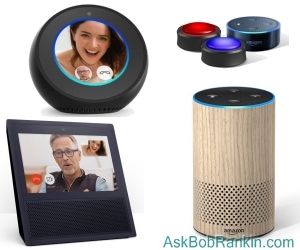 If you're a bit overwhelmed by all the Echo gadgets, here is a handy table that summarizes and compares the features of the Echo, Echo Dot, Echo Plus, Echo Spot, and Echo Show. Scroll down a bit on that page to find the table. So there's the Echo Plus for the living room, controlling your music, lights, and locks. An Echo Show in the kitchen, for video calling and recipes. A few Echo Dots scattered around, to make sure you're surrounded by music, and quick answers to your questions. An Echo Spot in the bedroom (presumably facing your bed) to wake you up. Another one in the nursery to watch the baby. And an Echo Look in the bathroom, dispensing fashion advice as you try on clothes. Amazon already knows everything you browse and buy. Now they're asking to be inside your house, listening, watching, waiting to be helpful. Is it silly to worry about being surrounded by so many always-on, voice-activated, video-enabled gadgets? Most recent comments on "Yes, There *IS* an Echo in Here"
Thank you for a great summary of the Echo products. And I must add that I love my Echo Plus. What could be neater and more convenient, when getting into bed at night, than first asking my Echo to turn on and play music of my choice from my Pandora selections,then verbally adjusting the volume, asking it to pause if a phone call or other interruption occurs, telling it to turn off after a given number of minutes (after I have fallen asleep), and then asking it to wake me up at a specific time the following morning? And this covers only the music aspect of Echo Plus. I'll stop here lest I'm accused of being a shill for Amazon. Really informative but I don't feel comfortable being SO connected. Cell phone goes on airplane mode at night and stays in my office. I'll soon buy an Anker bluetooth speaker on amazon so I can listen to music on itunes from my phone in the kitchen. Don't see myself ever getting one of these Echo et al gadgets. Not one function is calling my name. Facetime and whatsapp is all I need for video calls. What am I missing here? Are the Echo"s" and like devices the enhanced modern day versions of the GPS enabled ankle monitoring devices? Well, let's see. Buy a smart thermostat and get hacked, an Echo and get hacked, any Internet connected devise and get hacked. Until the hackers are caught (never) or "toys" get hack proofed I will do without them. Can I use the Echo as a BluTooth Speaker? That is, can I stream sound from my computer or tv using BluTooth to the Echo? Well I love my 3 Dots and feel they are a big help in my life. One in computer room, one in kitchen/LR and one in the bedroom. I have them read books, play music, wake me, remind me of appointments, remind me to turn off my sprinklers, put my trash out, and other things I need to do. Very useful and "no" I don't care if they are listening to me as long as they do what I ask. Yes you can use Echo as a BluTooth speaker. As a first gen Echo user (along with 4 dots scattered about the house), I'm not at all impressed with the new gen products. While the Echo is good for answering many questions, it falls far short in many ways. Sure, it can give limited weather forecasts, play music and create grocery shopping lists, but I find more and more it wants me to pony up money. Also, Amazon has now ok'ed 3rd party advertisements. I'm aware of where this is eventually leading.....more money out of my wallet. I'm a Prime member and I bought the Echo to enhance my user experience, not be another drain on my finances. It's gotten to the point where I can ask Amazon to play an old song and it will tease me with a few bars and then offer to sell it to me. Not for me I use W.I.F.E bloody brill and it cost me now't, it even reads my snail mail. Not that I get any.... Not even any bank or credit card post any more. I am inclined to think Google is about fight back Amazon's current 70% share in this hottest gadget market (VirtualAssistant, SmartGadget/Home/Speaker). Amazon's Alexa-based devices have also leveraged Microsoft's own Cortana, through an (inter-operability) agreement between the two other elephants on the stage. Other bit players on the sidelines are about to release similar products: Sony, Panasonic, Lenovo, HarmanKardon, JBL, Onkyo, Bose, Libratone, and the Chinese contingency... I will wait until the 3rd generation GoogleHome products which are able to answer my simple question about 'toad licking' or 'psycho-active compounds in frogs' w/o "I can't help you with that question" reply. Thank you for the summary - I truly appreciate your work.